Two points may draw a line but two film reference points are not enough to draw any meaningful conclusion on a genre. 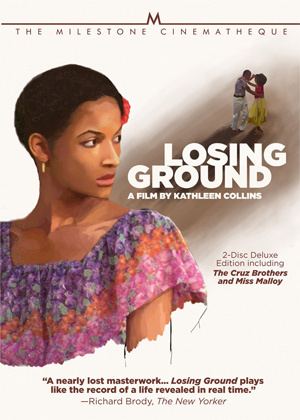 I’ve only got two examples with which to understand the films of director Kathleen Collins, both of which are now out on Milestone’s new 2-disc set Losing Ground: a Film by Kathleen Collins. The set also includes, The Cruz Brothers and Miss Malloy. These are the only films to have been made by Collins, who died in 1988 at the age of 46. Kathleen Collins was a middle-class woman of color with a high-powered education, who was an acknowledged playwright, and a respected and popular faculty member at City College of New York. In 1982 she produced and directed the first feature film to be produced and directed by a black woman. Thus as a white male I have to watch Losing Ground from the outside and I’m more or less disqualified from making any meaningful comment on it. In a curious irony, one of the many ideas touched upon in this film is the nature of being the outsider looking in. It would be pointless and unfair to Losing Ground and to Collins (and cinematographer Ronald K. Gray) to hold Losing Ground up to (admittedly white male) mainstream film. There may be some accuracy in this evaluation in as much as we are all human, and on that human level in which we all operate, I may have recognized a thing or two common to Collins and myself. But I think I can speak to Losing Ground as being a “first”. What does it mean to be the “first” of anything? Call it the “Viking” phase of any exploration. Being first to do a thing is often the most important aspect of that act — overcoming all odds, going without knowledge of where you are headed, what you will find, even what your discovery may mean. Simply touching the unknown shore trumps any rudimentary settlement or failed farmsteads. Even if the memory of your voyage is temporarily lost and there is no further connection of your deed to history, you were the first to go there and it is a grand thing. However there comes a point in Losing Ground when I’m not such an outsider and that is when the subject of art and particularly painting comes up, as I’ve been painting and making graphic art for 50 years. Maybe now I’m on the inside and Collins is the tourist? The scenes with Victor (the painter-husband of Sara the main character) at work and talking about his art do make me cringe. Victor is such a romantically stereotyped North Beach beatnik whose dialogue is so second-hand profound that he is hard to watch. Trying to explain painting defies description and I have yet to see or hear a fair telling of the act. If it could be told, we’d all have heard that explanation by now. The closest thing to a true telling of the painting experience I have come across is in Joyce Cary’s “The Horses Mouth” (the book, although the film has its moments too, but I digress). The sad thing is that we’ll never see Collins’ next film, the one in which she might have refined her own voice and the film which might have shown to us what parts of Losing Ground were intentional, or accidental, and which were mistakes (if any). Losing Ground is singular and odd but not singularly odd. It was an anomaly when it was made and a landmark today, which is often what happens to “firsts.” The rescue and restoration of both films is a by-the-skin-of-their-teeth story and the world would surely be a lesser place without them. I cannot emphasize enough how important watching the interview with Seret Scott (Sara) is to the appreciation and understanding of Losing Ground. I went back and watched the film with the commentary track by film professors LaMonda Horton Stallings and Terri Francis, and while they do display their film critique chops and deep film knowledge, they do so in such an archly film-studies way that for me it sucked the life right out of the film. Scott on the other hand puts a human face on the film and made me forget the academic commentary. Having access to Scott’s interview is the reason to own this set. The interview with Collin’s daughter Nina Lorez Collins is also a sweet behind-the-scenes and personal remembrance of the making of Losing Ground and living life with Kathleen Collins. Cinematographer Ronald Gray is also interviewed and reveals the details of the hard fought, against-all-odds, making of Losing Ground and how he came to be a major part of both films. His student film from 1976 is included as well. Cathleen Collins is also seen in a 1982 interview, though for me hearing her speak did not open up Losing Ground like Seret Scott’s interview.